Professionalism may be thought of as the conduct that can be legitimately expected of professionals given a reasonable understanding of their proper role in society (Kristinsson, 2014). This essential reference to the proper role of professionals turns professionalism into a normative concept, i.e. a concept that is inherently action-guiding. On this view, the skill and effectiveness of a mass-murderer couldn’t possibly be an example of professionalism, because the element of legitimate purpose would always be missing. By the same token, occupations concerned about increasing their professionalism should focus not only on improving their skills and knowledge but also, and most fundamentally, on critiquing their own work in light of relevant and legitimate normative commitments. Based on this understanding, professionalism can be defined as knowledge, skill and care in an occupational role (Kristinsson, 2013). The knowledge component implies a certified ability to discern, describe and explain both facts and underlying principles, and to present customers and clients with helpful and realistic options and advice. The skill component connects theory and practice, and making that connection is, of course, the constant endeavor and challenge of every profession. The care component implies an independent commitment to the values internal to the occupation, containing at least three distinct elements: service, morality, and occupational standards. First, the commitment to service means that professionals should be concerned to help clients and society to achieve an important value (or cluster of values), around which their occupation is specifically organized. The classical professions of medicine, law and the clergy are thus committed to the values of health, justice and salvation respectively, and journalists have similarly declared their commitment to “public enlightenment” (Society of Professional Journalists, 2014). Second, the commitment to morality speaks against all dubious practices, such as trying to serve too many clients, overcharging customers, misleading for the sake of profit, gossiping about clients or customers, etc. Such behavior is unprofessional because it undermines trust. The public must be assured that professionals will generally be honest rather than self-serving, and also that they will not overstep ethical boundaries in their enthusiastic quest for effective service. Third, the commitment to standards of practice provides clients and the public with an assurance that irrelevant interests or external pressure will not unduly influence the quality of the professional’s work. It means the professional can be counted on to act out of professional self-respect. The care component of professionalism, with its threefold commitment to service, morality, and standards, distinguishes professionalism from the attitude of working only for the sake of the reward. An occupational group that lacks independent commitment to the internal values of the occupation does not deserve or earn public trust, so that every client must protect his or her own interests in dealing with such practitioners. This is why a code of ethics is considered a necessary structural characteristic of a profession. A professional code of ethics provides members of the profession, and the general public, some assurance that each member is committed to the values internal to the occupation (Davis, 1991). To the members of the profession, the code should reduce worries about free riders and signal a collective concern for public service, moral behavior and professional standards. To the public, the code promises that individual members of the occupation may be counted on to work honestly even when nobody is looking. A general definition of professionalism can thus be put as follows: Professionalism is certified knowledge, skill and care in an occupational role. The component of care entails a commitment to the internal values of the occupation, the elements of which are a service to society, moral behavior, and occupational standards. This threefold commitment is signified by a professional code of ethics. A knowledge monopoly: No one outside the profession has the knowledge and ability to do the work of the profession. A clear division of labour, and the power to keep others outside the profession. Strong professional education and research. Strong professional organizations with ethical rules and standards. An ideology that asserts greater commitment to doing good work than to economic gain and to quality rather that economic efficiency of work. Against this background, we suggest a six point criterion against which it may be assessed how far, and in what ways, the social and occupational group of Icelandic journalists can be said to be a profession. This six-point criterion is drawn up in Table 1 and divided up into three parts according to how commonly these characteristics appear in the general discussion of professions. The presentation of these criteria is not intended to suggest, however, that they are absolute in the sense that either journalism (or any other occupation) meets all the points, and can thus be labelled a profession, or that it does not meet these points, and should consequently be deemed a non-profession or a semi-profession. Rather, these points constitute road marks that help in determining the nature and development of journalism at a given time and in a given place. Some points are important in certain contexts while others may be of greater significance in other contexts. Similarly, it is important to note that these sociological criteria for applying the concept of a profession are not intended as a measure of professionalism. An occupational group that satisfies few of the sociological criteria might nevertheless be characterized by a high level of professionalism, and vice versa. Indeed, the sociological criteria themselves should be considered and evaluated based on their role in providing conditions conducive to professionalism. In this regard, five of the six characteristics are easily seen as having the effect of providing a reliable framework for professionalism. The sixth condition, of public licencing and monopoly of occupation, is perhaps best understood as a means of protecting the public from unprofessional service, while the other five conditions should have the function of stimulating and safeguarding the professionalism of practitioners themselves. We will now look at each of these points in the Icelandic context. The level of education of Icelandic journalists has increased in the last few decades, as has indeed the general level of education of the Icelandic population. Most of the larger traditional media require university education although such a requirement is not a strict condition for employment across the board with all major media organisations. However, the university education required can be from a variety of academic fields and only some journalists – albeit an increasing number – have an education specifically geared towards journalism or media. Still, many media companies have their own “journalistic exams” that they require applicants to pass before they are hired. These exams are meant to test the applicant’s knowledge of current affairs and aptitude in the Icelandic language. Two universities in Iceland offer media or journalism education, the University of Iceland offering a MA programme in journalism and the University of Akureyri offering a BA programme in media studies. Unlike the systems that are in place in other Nordic countries, there are no special provisions for continuing education for media professionals in Iceland, and no institution specialises in this field. The continuing education system has been built up in a different manner. Funds, partly provided by the Journalist Union (Blaðamannafélag Íslands), give journalists the opportunity to attend courses that are generally available in the public market or within the education system (Guðmundsson, 2009). Recent empirical evidence suggests that formal university education in journalism and media studies in Iceland supports the socialisation of media students into the ideology and understanding of journalism that is already prevalent in Iceland. A survey, conducted in 2012, among students in media related degree programmes at the University of Iceland and the University of Akureyri, found that their ideas about the role and purpose of journalism in society were very much in line with the ideas that have been expressed by practicing journalists in Iceland. 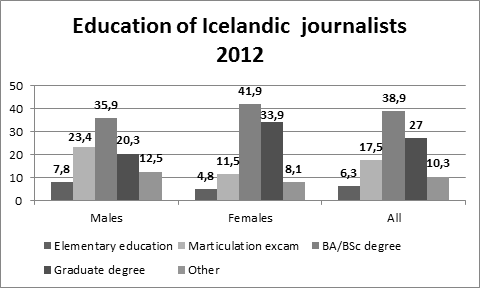 Over two thirds of these students intended a career in journalism (Jóhannsdóttir and Guðmundsson, 2013). According to an internal survey done by the Union of Icelandic Journalists (Blaðamannafélag Íslands) in 2012, about two thirds of the union’s members have completed a university degree as shown in Figure 1. Almost all Icelandic journalists are members of the Union so this can be seen as the general pattern. Only news reporters of the Icelandic State Broadcasting Company, RÚV, are in a different union. In that company a university education is required for employment, so if this group of journalists is also taken into account the proportion of Icelandic journalists who have completed a university degree is certainly higher than two thirds. A comparison between the Union survey of 2012 and a survey done in 2009 shows that the education level of Union members has increased slightly and that this increase is largely due to the rising number of women among journalists. Women journalists tend to be more educated than men, as 59% of the men in the 2012 survey had completed a university degree compared to almost 76% of the women. Similarly, more women had a graduate degree than men, or 34% compared to 20% (Guðmundsson, 2013 a). A commitment to service is an essential characteristic of professionalism and a universally recognized feature of professions. How do Icelandic journalists understand the social purpose of their occupation? Although it may be difficult to generalize about the whole population of Icelandic journalists, some trends can be suggested as important characteristics for the group as a whole. 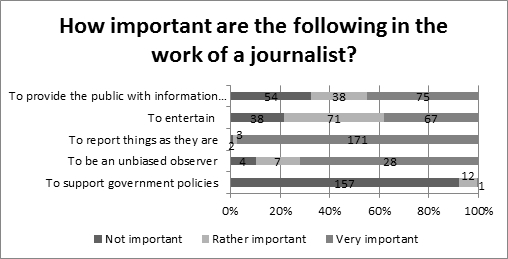 One suggestion can be found in the Worlds of Journalism Study (WJS) survey that was conducted in Iceland in 2012. The preliminary results show that concepts like “democracy”, “analysis”, “honesty” and “watch dog”, commonly popped up in answers to an open ended question on the purpose of journalism. In general, the results of the study suggest that Icelandic journalists believe it to be their role to inform and entertain as objective observers. They thus share a similar ideology to that of their colleagues in Scandinavia and in Europe (Kolbeins, 2013). This becomes apparent when Figure 2 is examined, especially the practically unanimous emphasis on “reporting things as they are”, and the clear rejection of the idea that it is important that journalists support the policies of the government. This public service ideology is further exemplified in the Ethical Code of the union as discussed below. In general it is problematic to assess the degree of autonomy of journalists in any country and that holds true for Iceland as well. However, four elements can be pointed out that indicate what characterizes the situation in Iceland. Firstly, most journalists in Iceland are employees and must submit to the internal editorial discipline of the firms where they work. This does not, however, automatically mean that they do not enjoy certain autonomy in their work. In addition a number of journalists work free-lance and there is considerable mobility of journalists between different media. Thus, although the individual journalist obviously has to adhere to editorial steering of an editor and the media firm he works for, there is also some room for journalistic autonomy. Secondly, the written Ethical Code of the BÍ provides some guidelines regarding editorial integrity and the imperative that the journalist should follow his own conviction. Article 5 of the Code states: “A journalist writes always on the basis of his convictions. He makes sure not to confuse editorial material of clear informative and educational value with advertising in pictorial and / or written form” (Blaðamannafélag Íslands a ). The Code is generally considered to be the foundation of good journalism and is therefore an important instrument for preserving the autonomy of journalists. Even though it does not provide any legal protection it would be almost unthinkable for a media firm or an editor to openly admit to requiring a journalist to breach the Code. In addition to the general Ethical Code of the BÍ, many of the larger newsrooms have in-house editorial guidelines that harmonize with the general Code in terms of the importance of editorial independence. Thirdly, the Media law from 2011 has in its 24th article a special provision on editorial independence. The law dictates that all media firms are required to make special rules on editorial independence, in cooperation with their news reporters and staff who are creating news related content. These rules should include, according to the law, sections on: a) the working conditions for staff when following the editorial policy of the firm in question; b) in what way the editorial independence of staff – including editors- is guaranteed vis a vis the owners of the company; and c) conditions for reprimand and layoffs of journalists, including editors (Lög um fjölmiðla,2011). These rules are required to be made in cooperation with the Journalist Union and sent to the Media Surveillance Authority, which then publishes them on its website. The law has no further directions on how to enforce this clause or monitor it. The Media Surveillance Authority has declared that it falls outside its legal jurisdiction to monitor whether these rules are followed or not by individual firms. However, the BÍ has taken the matter up on two fronts. On the one hand the Union sent out guidelines on what issues should be addressed in this contract and in fact drew up a template agreement that has been published on the union’s web site. In this template, the editorial power of the editor is acknowledged but at the same time the autonomy of the journalists is stressed, e.g. by suggesting that a journalist cannot be asked to write anything that goes against his/her conviction (Blaðamannafélag Íslands b). On the other hand the BÍ has established a special group within the board of the union, a professional advisory group (Fagráð), led by the vice-chairman that is supposed to deal with professional issues that come up. This group has now the role of monitoring and dealing with complaints that arise because of a breach of the individual contracts on editorial independence (Guðmundsson 2013 b). In spite of some efforts by the union to publicise this channel for complaints against breaches against the agreements on editorial independence, no cases had come up by the end of 2014 (Guðmundsson & Sigurpálsson, 2014). Fourthly, the preliminary results from a WJS survey of 2012 also provide some indication regarding autonomy in the work place for Icelandic journalists. One of the questions in that survey was “how much influence does the following have on your work?” As can be seen in Figure 3, editorial independence might be said to be considerable when viewed in terms of the low score received by “influence of the managers of the media companies”, “the owners” or general “censorship”. And indeed the influence of the editorial supervisors is acknowledged – influence which in many cases might be considered to be of a professional or journalistic collegial nature rather than external interference. However, somewhat contradictory is the finding that more than half of the respondents say that self- censorship has some or much influence on their work. This suggests and draws out the complex nature of autonomy: If every other journalist practises self-censorship to some degree, how is that a voluntary professional decision? Arguably, a journalist’s professional autonomy is compromised to the extent that he or she makes decisions influenced by fear of inviting opposition from powerful special interests. Unfortunately there was no definition of self-censorship in the survey and therefore it is not possible – in spite of the significance of these answers – to determine the nature of the self-censorship to which the respondents refer, or if indeed they understand the term in a unified way. An important point on the self-censorship issue was highlighted in the Parliamentary Investigative Report from 2010 on the financial meltdown in Iceland. Through interviews with journalists and editors, the Investigative Committee was able to conclude in its report that considerable self-censorship was present in the media prior to the crash (Rannsóknarnefnd Alþingis, 2010). The media was reluctant to cover the financial situation in a critical manner as economic interests and owners’ interests were at stake. Two explanations are suggested in the Report. One was that because of the ownership concentration in the media market employment opportunities for journalists critical of their owners were limited. The other was that the business-journalists of the media had established an all too cosy relationship with the business elite, which limited their critical approach. This conclusion of the report has been reiterated by one of its authors in 2014, where he points out that self-censorship can in fact be more effective than direct attempts from outsiders to censor editorial content (Vilhjálmur Árnason, 2014). The presence of a strong professional organisation is a common element in definitions of the sociological concept of a profession. The Union of Icelandic Journalists, Blaðamannafélag Íslands (BÍ), is both a trade union and a professional association. The union was founded in 1897 and was, along with other Scandinavian journalist unions, among the first to be established in Europe. For the first several decades, the Union was more of an editor’s club with a low level of activity. From the mid-1930s until the end of the Second World War the Journalist Union was dormant, except for two revivals where an attempt was made to redefine its role in defending and attending to the rights and work conditions of journalists (Guðmundsson, 2007; Haraldsson, 1987). From the late 1940s the Union has operated continuously to the present with classical trade union functions such as wage bargaining, working conditions and rights being an important part of its existence. While performing an important role in guiding the material interests and formal rights of Icelandic journalists, the BÍ began to widen its scope of activity in the late 1960s onwards. Greater emphasis was put on the BÍ becoming a professional union as well as a trade union. In the mid 1960 the Ethical Code and Ethics Committee were first established and in the following decades a number of measures were taken by the BÍ to support independent journalism. This process went hand in hand with the loosening of political parallelism in the Icelandic media, as party based media was slowly giving way to market driven media under the ideology of objective, independent journalism (Guðmundsson 2007, 2013 c). Changes in the way in which the leadership of the BÍ was selected and the regular publishing of a professional journal, Blaðamaðurinn (The Journalist), are examples of this development. The significance of the BÍ for journalists and the media in Iceland has increased in the last two decades. More complex labour relations that accompany market media along with new technology, increased mobility of journalists, copy right issues and job security have highlighted the trade union role of the BÍ. At the same time its other main function, to by a professional association, has received greater attention and efforts by the BÍ leadership. This is manifested in the increased force put into the publication of the printed organ, the establishment of a web site primarily dealing with professional issues, a variety of conferences and debates on professional issues and last but not the least the establishment in 2003 of a Journalism Price which is handed out every year in four categories (Guðmundsson 2007, 2013 d). Adherence to a professional code of ethics is a key marker of professionalism, and the formal approval and maintenance of such a code is often taken to be a necessary condition for falling under the concept of a profession. The Union of Icelandic Journalist has had in force a Code of Ethics since 1966. The Code underwent a major revision in 1991. Accompanying the code is a regulatory institutional structure with an Ethics Committee which deals with issues and complaints brought against journalists and media that are thought to have been in breach of the code. The Ethics Committee consists of five members, three of whom are elected by the Journalist Union, one member who represents the media companies and one member appointed by the Centre of Ethics at the University of Iceland. The Journalist Union finances the operation of the committee and handles practical matters regarding its operation. The rulings of the committee are published on the Union website and in the printed journal. Furthermore, the medium in question is also obliged to publish the decisions. The powers of the Ethics Committee lie solely in its nature as peer-evaluation, and no further sanctions are involved. Indeed the committee has adopted a working rule that if a complaint is taken to the courts it will not be dealt with by the Committee. A considerable discussion and dispute has taken place on the Ethical Code in the last decade. In 2005 a revision committee was established following a discussion related to an aggressive editorial policy of a national tabloid newspaper in Iceland. Some consecutive general meetings of the union postponed a decision on a new code. The matter has not been resolved and has not been taken up since the Journalist Union´s general meeting in 2012. Two main motions constitute the opposite sides, one from the board of the Union and the other from 31 individual journalists. In short there can be said to be unity on some primary moral duties and definitions of the role of journalists. These duties relate to the obligation to tell the truth and inform the public, to refrain from conflict of interest and to honour the confidentiality of sources. The disagreement concerns the extent to which the Code should refer to personal responsibility of work methods on the one hand, and to social responsibility and consideration on the other. The question can be said to be whether the Code should be a minimum common denominator for practicing journalists, which was the position of the 31 journalists, or if it should explicitly acknowledge personal and social responsibility for journalistic activities in general as the board suggested. As already mentioned, the role of monopoly and licencing in supporting professionalism is not as clear as the role of the other five elements discussed here. Although these requirements have the effect of protecting the public from unprofessional practices, they are only indirectly involved in generating and sustaining the practices themselves. Iceland, as most other countries, does not have any formal barriers as to who can call him/herself journalist or work as a journalist. In the Media Law from 2011 there are requirements for media companies to register themselves and publicly state their editorial policies, which are consequently published on the web page of the Media Surveillance Authority. However there is no mention of any conditions or obligations of journalists. The matter has been of some concern to the Icelandic Journalist Union as social media and bloggers have taken up ever more of the public sphere. The union´s professional journal, Blaðamaðurinn (The Journalist), has initiated some discussion of the necessity of distinguishing between journalism proper and “journalism-like” activities. This discussion has however been somewhat overshadowed by the development of the online media, and the unedited content of social media and blogs has increasingly become the subject of traditional media outlets blurring the line between content that has undergone journalistic evaluation and unedited opinions and statements on the internet. The only formal credential available suggesting that a person is working as a journalist rather than as a blogger or “citizen’s journalist” is the membership card/press pass issued by the Journalist Union. The condition a person has to meet to obtain such a membership is that a certain proportion of his/her income is derived from working in media or communication related activities. Thus hobby bloggers are excluded from being members of the Union, but apart from that the inclusion criteria are fairly broad. When the occupational group of Icelandic journalists is measured against the six-point criterion proposed earlier, it can be said that at least five out of the six points are met (See Figure 4). Icelandic journalists have a public service ideology, a professional organisation, a written code of ethics and a mechanism for self-regulation. These elements are all very much present in the reality of Icelandic journalists. In addition, it is at least partly true that Icelandic journalists have professional education and indeed specialized intellectual skills as well as professional autonomy. Some of these criteria are more applicable to Icelandic journalist than others, but they are all relevant to some extent. The only criterion listed above that does not apply to Icelandic journalists, or does so only in a very limited way, is that of official licensing and monopoly of occupation. The absence of monopoly and licencing is noteworthy for interesting reasons. As already pointed out this element in the concept of a profession stands apart from the others with respect to its relationship to professionalism. While professionalism within an occupation is directly supported by the first five elements, the sixth element of monopoly and licencing does so only indirectly by protecting the public against unprofessional service. The fact that Icelandic journalists do not enjoy monopoly or licencing may thus raise the question whether the public needs further protections from unprofessional journalism. Once that question is raised, however, a conflict is bound to arise between this idea of journalistic monopoly on the one hand, and the very idea of journalism and the basic value of freedom of expression on the other. Freedom of expression is an integral part of the concept of journalism and at the same time it is a basic right that must be available to all – not only to a certain profession. Figure 4 Icelandic journalists and the elements of the concept of a profession. Icelandic journalists can, according to this, be seen to have many of the important characteristics of a profession, although it might still be open to question whether they constitute a profession in a classical sense. As has been pointed out by Nolan (2008), it is however perhaps not possible or even the most fruitful question to resolve whether or not journalists constitute a profession. Rather, the attention should be on the development and fluidity of the discussion and conduct of journalism practice, i.e. whether a process of professionalization or even de-professionalization is taking place. By looking at the Icelandic development in terms of how lucid the discussion on what constitutes professional journalism is, one can indeed come to somewhat contradictory conclusions. On the one hand, Icelandic journalists have expressed a desire and concern for professionalism and journalistic values; on the other hand, the media system realities, including the workings of self-censorship, have limited the opportunities for fully implementing or acting on that desire. Put in a wider context, this local situation seems to reflect more general conditions for journalism. Örnebring (2009) suggest that journalism can be seen as a continuous negotiation between two different sociological understandings of professionalism, a Weberian notion and a Durkheimian one. On the one hand, journalism has to deal with the external demands by the organisational environment with its routines and goals of the media companies (Weberian); on the other hand, it is committed to the occupational professionalism of the journalists themselves who develop their own values, norms and identity (Durkheimian) (Örnebring 2009; Nolan 2008). In Iceland, this process of negotiation is clearly very much alive. Bayles, M. C. (1981). Professional ethics. Belmont, CA: Wadsworth. Friedson, E. (2001). Professionalism: The third logic. Chicago, IL: University of Chicago Press. Guðmundsson, B. (2013). Pólitísk markaðsfjölmiðlun. Stjórnmál og stjórnsýsla 9(2), 509-530. Hallin, D. C. & Mancini, P. (2004). Comparing media systems. Three models of media and politics. Cambridge: Cambridge University Press. Haraldsson, Þ. (1987) Grúskað á safni. Slitrur úr sögu BÍ fram á sjötta áratuginn. Blaðamaðurinn 4/9. Hargreaves, A. (2000). Four ages of professionalism and professional learning. Teachers and Teaching: History and Practice 6(2), 151-182. Hughes, E. C. (1963). Professions. Daedalus 92, 655-668. Jóhannsdóttir, V. & Guðmundsson, B. (2013) „Viðhorf og væntingar blaðamennskunema til blaðamennsku“. Presentation at Þjóðarspegillinn Rannsóknir í félagsvísindum, XIV. Kanes, C. (2010). Challenging professionalism. In C. Kanes (ed. ), Elaborating professionalism: Studies in practice and theory (pp. 1-16). Dordrecht: Springer. Koehn, D. (1994). The ground of professional ethics. London: Routledge. Kristinsson, S. (2013). Að verðskulda traust. Um siðferðilegan grunn fagmennsku og starf kennara. In Rúnar Sigþórsson, Rósa Eggertsdóttir og Guðmundur H. Frímannsson (eds.) Fagmennska í skólastarfi: Skrifað til heiðurs Trausta Þorsteinssyni (pp. 237-255). Háskólinn á Akureyri og Háskólaútgáfan. Kristinsson, S. (2014). The essence of professionalism. In Christopher M. Branson and Steven Jay Gross (eds.) Handbook of Ethical Educational Leadership (pp. 11-23). Routledge. Kultgen, J. (1982). The ideological use of professional codes. Business and Professional Ethics Journal, 1(3), 53-69. Nolan,D. (2008) Professionalism without professions? Journalism and the paradox of ‘professionalization’. Proceedings from the Annual Conference of the Australian Sociological Association. Melbourne: TASA & SAANZ. Retrieved 18. January 2015 from https://www.tasa.org.au/wp-content/uploads/2011/05/Nolan-David-Session-19-PDF.pdf. Schudson, M. (2001) The objectivity norm in American journalism. Journalism 2(2), 149-170. Örnebring, H. (2009) The Two Professionalisms of Journalism: Journalism and the changing context of work. Reuters Institute for the Study of Journalism Working Paper, Oxford University. Retrieved 18. January 2015 from http://reutersinstitute.politics.ox.ac.uk/publication/two-professionalisms-journalism.